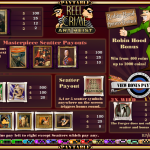 Reel Crime 2: Art Heist is the second episode in a two episode retro crime series. It is played over 5 reels / 15 paylines and developed by Rival. So if you loved the first episode Reel Crime 1: Bank Heist this one would certainly pick your interest. Just like in the first game the theme here is a retro crime operation where the object this time is stealing art! The Wild in this game is the Forger symbol which will substitute other symbol (except for the scatters) to create a winning combination. All your wins using it will comes with a 2x multiplier. Moreover, it is also the jackpot symbol so landing 5 of it will get you 5000x of your bet!. 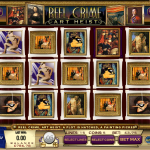 There are several scatters here but the main one is the Reel Crime Art Heist symbol. It will activate the main bonus feature when you land 3 or more anywhere on the reels. Activating the bonus is your real objective here because there are 5 rounds and each one brings you more prizes. To move to the next round you need to land 4 or 5 of the other scatters. There are detailed instructions in the game about the objective of each round. Another nice feature is the Robin Hood Bonus Round. This is triggered randomly when you play maximum coins. Once triggered there’s a mini-game that will win you between 400-1000 coins. Like the first game we really like the the second episode two. The graphics are a bit old but the the story is refreshing. However the only negative is that if you don’t manage to activate the bonus features and move to the next stage it can be pretty frustrating. Do you think you have what it takes to Ocean 11 it? 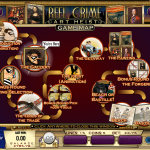 If you like this game why not try playing its first episode, Reel Crime 1 a 5 reel slot by Rival.